Ya know how you start your day with an idea of the tasks at hand? Work on blog stuff, finish honeysuckle jelly, strain the honey from the comb we had to remove from a hive yesterday. You know, that kinda stuff. Well that’s how my day started, then everything changed. RancherMan came in from the pastures & told me it was time to suit up, we’ve got a bee swarm to catch. Woo-hoo! Apparently he saw a swarm of bees about 15-ft up in a tree right near our pasture gate. 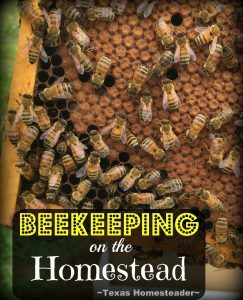 We’ve never captured a swarm before so here’s yet one more opportunity to learn something exciting about beekeeping! And maybe get to add a new hive of bees to our group as well. Can We Catch A Bee Swarm In A Tree From The Ground? 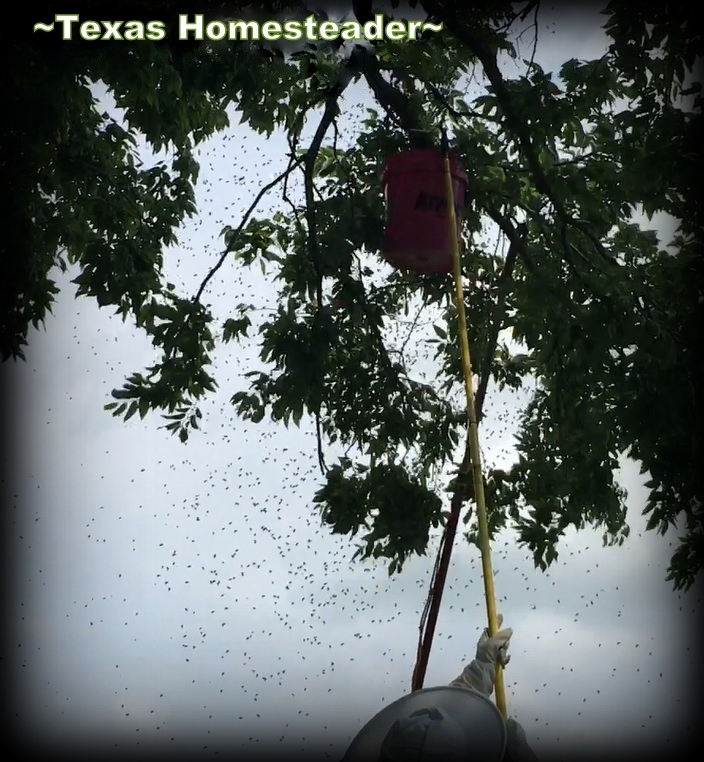 Now there are apparently lots of different ways to catch a bee swarm. We’ve heard others speak about their experience catching swarms and we’ve studied and researched other ways to catch them too. But we’ve never actually caught a bee swarm ourselves. So this will be exciting, but fifteen feet up? It seems risky to crawl atop a tall ladder since this is our first swarm and we’re really not sure what to expect. Wouldn’t it be great if there were a way to do this from the ground instead? Hummm… It’s time to put on our thinking caps. Catching A Bee Swarm: Use Whatcha Got! RancherMan hit his shop and pulled out a paint roller and removed the painting sleeve. Then he screwed it onto an extendable pole. Seeing the question on my face he explained he was going to take a 5-gallon bucket & hook the paint roller through the handle of the bucket. We should be able to stand on the ground and lift the bucket all the way up to the swarm. Excellent! How about this then”, I added. 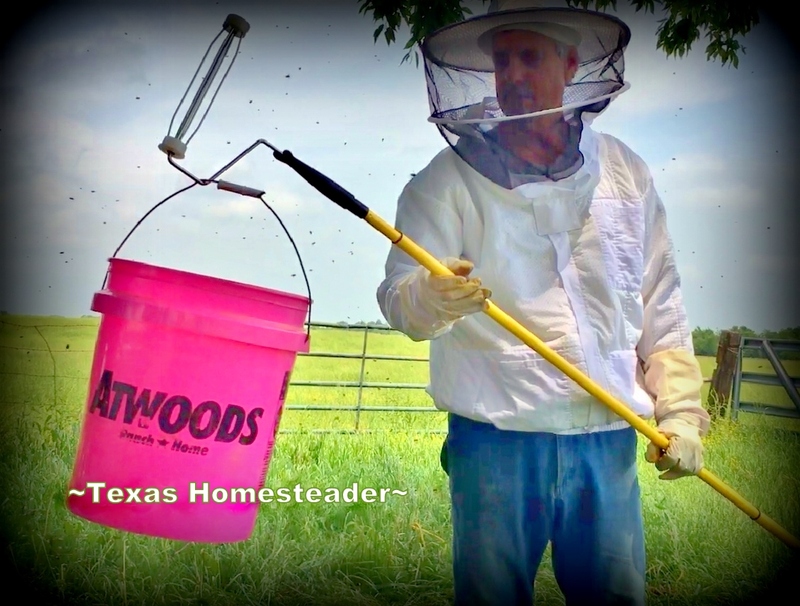 “We can also use that extendable handle limb lopper to hook around the branch and shake it, allowing the bees to drop into the bucket.” Aaaaahhhh teamwork. Gotta love it! But would it work? We already had a brand new painted deep hive waiting in the wings to add another hive anyway so we pulled it out and prepared. RancherMan got the smoker going and we slipped into our beekeeping gear – a vented jacket, veil & gloves. We were wearing the heaviest denim jeans we had and we slipped on our knee-high rubber boots. That should keep us well protected in the event the bees get agitated. Then out to the swarm we went. I hooked the 5-gallon bucket onto the paint roller & hoisted it high above our heads. I held it right under the swarm and RancherMan used the extendable saw’s hook to grab onto the limb and shake-shake-shake! Bunches of bees fell into the bucket. So I lowered it and RancherMan poured them onto the top of the open 10-frame deep hive we had waiting. We repeated this a few times until very few bees remained on the limb. About 15-20 minutes later the swarm was removed from the tree and the bees were in the hive box. We put an entrance reducer on the front since this new hive isn’t established. Our hopes are that the reducer will give them an easier time defending their new home. RancherMan also added a frame feeder along with a mixture of sugar & water at a 1/1 ratio. This should make it easier for the the new hive to get established. Then we placed this swarm’s hive on the elevated hive rack with the others. And just like that, our 4 hives turned to 5! It went great and we’re pretty sure we captured Her Majesty along with the others, the bees are now all happily residing in their new home. Yea! 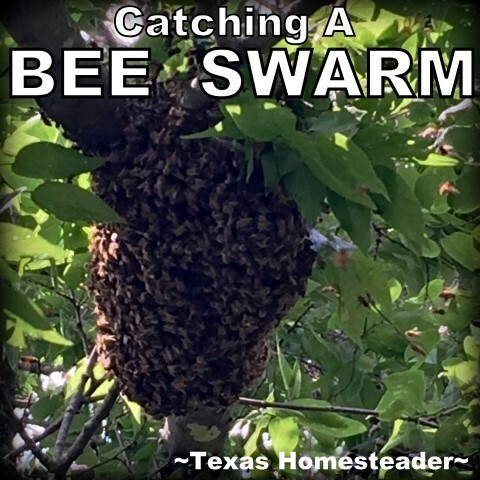 This entry was posted in Blog Posts and tagged Beekeeping, Spring on April 29, 2017 by Texas Homesteader. Congratulations on catching your first swarm! The old beekeepers who taught the class i took this spring said that in their experience, swarms can be drawn to other hives. All of them had stories about going out to check on their bees and finding a swarm that wasn’t theirs hanging out nearby. One said he keeps an empty hive body open out in his driveway during swarm season just in case, and one year he caught four swarms in just a few days that way, no work at all except to move the new hive to the backyard and put out another empty box! You never know, you could find another swarm tomorrow! That was really cool to read and see, thank you! Very interesting, I thought it would more time consuming as well. You make it look easy, but I’m sure there’s more to it than it looks like. What kept them in the bucket until you poured then on to the hive box? So interesting! Faster than I would have thought. Thank you for showing the film. You are both a lot braver than I! Congratulations on the new hive. Well done.